It's over, and it's not a total disaster! Thank goodness some of my friends showed up, like Yvonne Lee, Margie, Pauline, Eanny. And I met Yvonne Foong and Kit for the first time. And some other people I don't know actually sat down to listen too. I think there were about 20-25 people there, including the ones standing behind the pillars and bookshelves. Yvonne Lee was the most active participant in the Q and A, and she asked so many questions to keep the momentum going. Thanks Yvonne! Basically, I just talked about writing and publishing in general, and coming up with ideas for the stories. Then I did some book signing. My agent Jerry was there, and he brought along an editor. After that, Jerry held centre court as everyone networked and exchanged cards. Let's hope a lot more writers get published after this! The Singaporean editor Jerry brought along actually hated my first story :) But he thought the rest of the book was pretty good, though he says it can't come up to Edgar Allan Poe standards (obviously) because I described too much. Rodney, the store manager, was there all the time and was most supportive. He said I'd sold over 80 books in 1 Utama, and he had just reordered another 50. (I checked with the computer, and it said I sold 85 copies.) 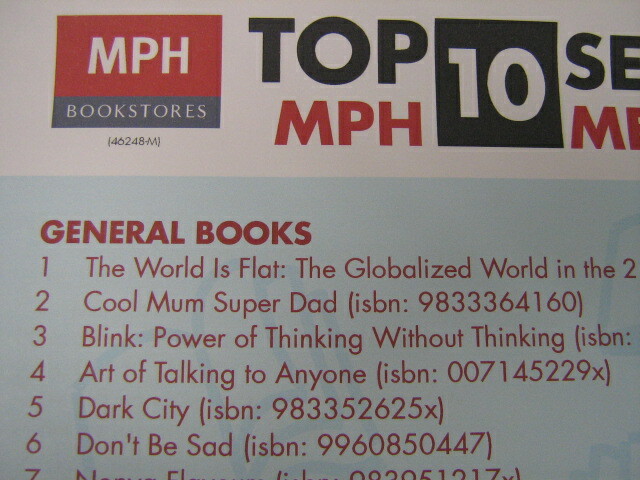 He also gave me a rolled-up copy of the Bestseller List which cited Dark City. So all in all, a new experience! Now for the Writer's Hi tea tomorrow. Apparently over 40 writers will be there at the Booker Room in 1 Utama. Lydia will be one of the moderators. Book exchange tomorrow, Lydia!! How exciting! Wish I were there, Xeus. Yes, I hope, with Jerry's help, many good writers will get published and Malaysia can catch up with some of the other Commonwealth countries as far as fiction publishing is concerned. Here's to the future of Malaysian authors. 'Prost'! Way to go, Xeus. Good to meet up with you yesterday. Here's to more successful talks. Lydia, yesterday was quite a revelation. I'll post more on it, but I think you did a great moderator job as far as I am concerned.